Today's B2B marketers are overwhelmed with the amount of content that they can produce. With so many types of content, how do you know which are the best options for engaging prospects and turning them into customers? One form of content that continuously comes out at the top is customer success stories. Whether written or in video format, customer success stories give leads what they want - proof that your products or services deliver results. In the past, customers would call a company and speak with a sales rep when they wanted to learn about a product or service. 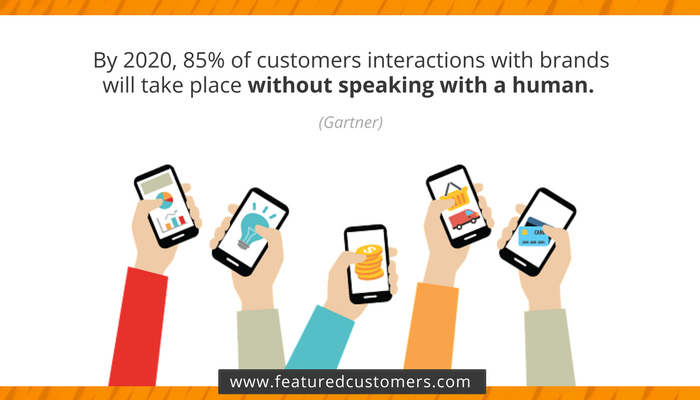 Now, they don't need to spend time on the phone and risk unwanted follow-up calls from reps. They conduct their own research and will only contact you when they are ready to make a decision. In fact, HubSpot revealed that buyers wait until they are 60% through the purchasing process before they talk to a sales person. Since you're losing phone time with potential customers, you must find other ways to prove the value of your product or service. You can attract B2B buyers with content that educates them and answers their questions throughout every stage of your sales cycle. A TechTarget study revealed that 65% of IT buyers need at least four pieces of content to make a shortlist of vendors. The more content you create, the more likely you will get your name in front of the right buyer at the right time. 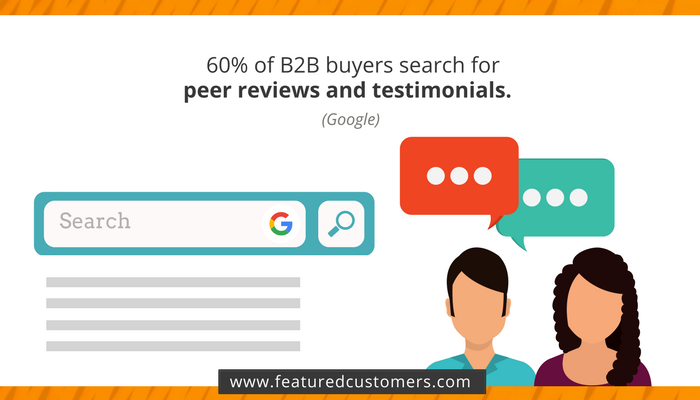 In particular, B2B buyers look for customer success content such as case studies, reviews, and testimonials. This is because they believe what their peers say about you - not what you say about yourself. 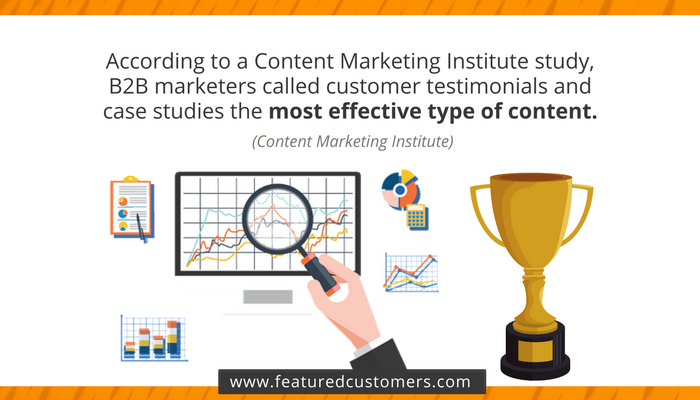 Publishing case studies and testimonials doesn't just help you win sales - it also helps you retain customers. According to Software Advice, buyers who sought feedback from customers prior to purchasing software were 2.5x more satisfied with their decision than those who failed to take this step. Collecting five-star, user-generated reviews is a key part of your content marketing plan. However, reviews don't give buyers the entire picture. 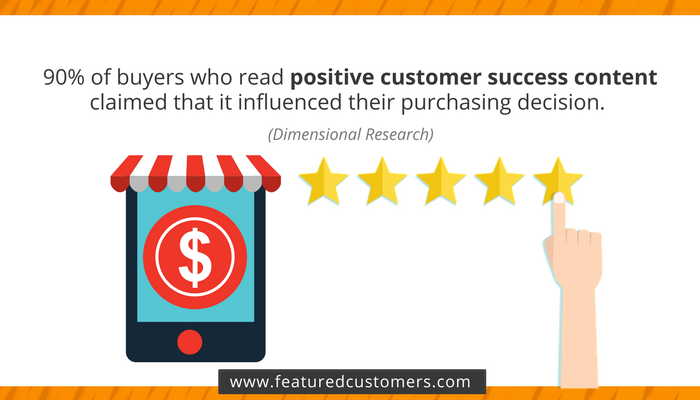 Customers often write reviews from their personal, user experience perspective. The user experience is important, but a review about it won't give prospects a complete picture of how you can help their business. Case studies, on the other hand, tell a full story. When prospects read a case study, they will learn how you helped a business solve one of their top challenges and achieve measurable results. Case studies are useful across all stages of the sales cycle. 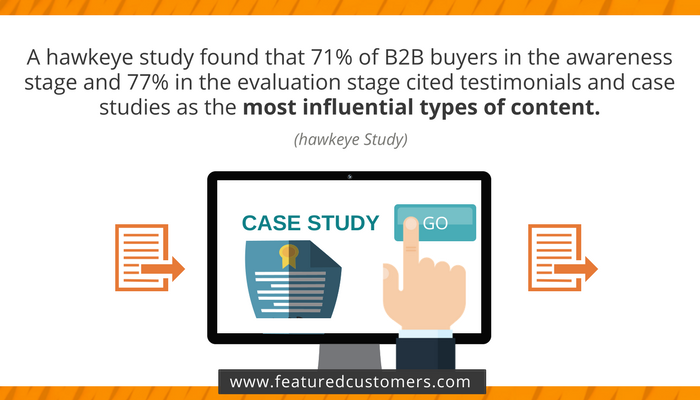 According to hawkeye, 71% of B2B buyers in the awareness stage and 77% in the evaluation stage cited testimonials and case studies as the most influential types of content. Buyers also look for case studies when they are getting ready to buy. Many Google terms such as "Company ABC + case study" when they are in the decision phase and need proof that a product or service works. It's not surprising that case studies are helping marketers reach their goals. The B2B Technology Marketing Group surveyed more than 600 tech marketers, and 44% of respondents said that case studies are the most effective content marketing tactic for lead generation. The remaining top five tactics included blogging, social media, customer testimonials, and in-person events. Many marketers make a significant investment in customer success content. But then, they bury their case studies in their websites and hope buyers will find it. 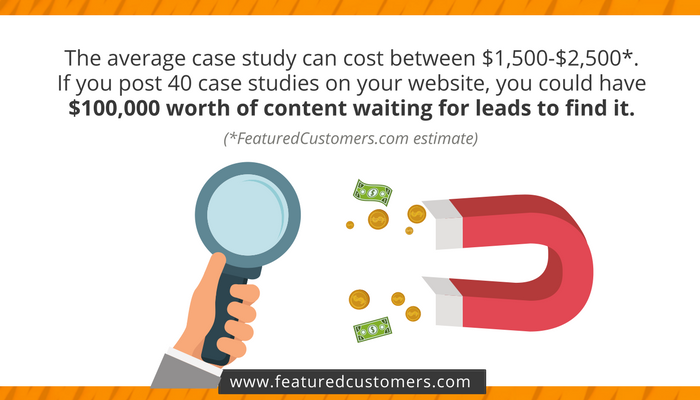 You might have 40 case studies in your resources section - that's $100,000 worth of content waiting for customers to read it. To get the most value from your investment, share your case studies across other platforms. For example, software buyers often visit third-party customer success directories before they make a purchase. If you post your case studies in these directories, you can get your product in front of customers who are ready to buy. Turbocharge your ROI from your customer success content by sharing it on FeaturedCustomers.com, the world’s largest directory of testimonials, case studies, and customer videos. Sign up today and gain access to qualified software leads who are ready to buy! Rachel Foster is a B2B copywriter and the CEO of Fresh Perspective Copywriting. She helps B2B marketers improve their response rates, clearly communicate complex messages, and generate high-quality leads. Rachel has taught white paper, sell sheet, and case study writing for MarketingProfs and was one of the Online Marketing Institute's Top 40 Digital Strategists of 2014. You can connect with Rachel on LinkedIn, follow her on Twitter (@CopywriterTO) or check out her B2B marketing resources at www.freshperspectivewriting.com.